“Don’t be forced to leave home! 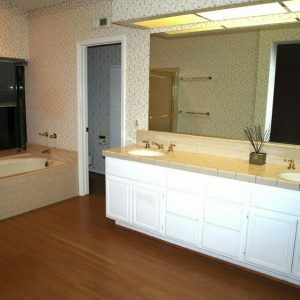 Remodel it to suit your needs and your abilities." 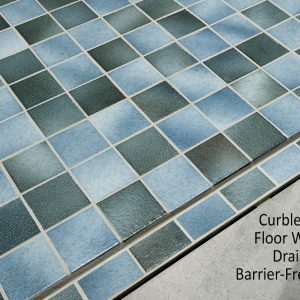 Universal Design (Aging-in-Place) Can make your home feel comfortable, safe and enjoyable for anyone or at any age. CairnsCraft Design & Remodel not only has the experience but is certified in building design living spaces. 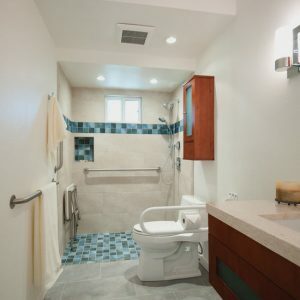 This fully wheelchair-accessible bathroom was created in a downtown condominium. 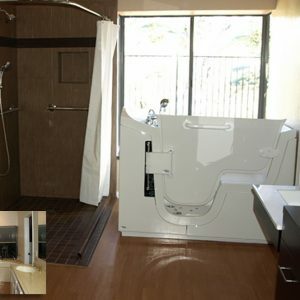 A standard 60″ bathtub was replaced with a walk-in tub with jacuzzi package and double shower. 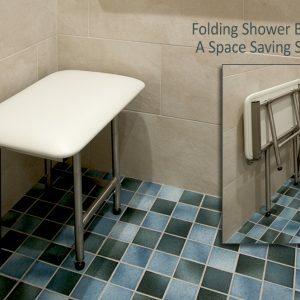 Fold-down rails make use of the toilet safe and secure. 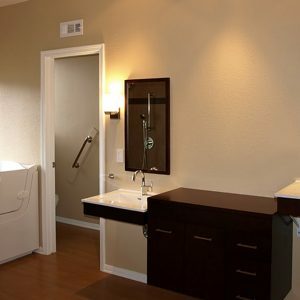 The unique vanity cabinet design is a floor model cabinet with recessed area under the sink for wheelchair access, but provides extraordinary storage space. Likewise, the full width, wall-mounted medicine cabinet brightens the room while providing almost 5 feet of space for storage of medicines and smaller items. CairnsCraft Design & Remodel modernized this 1970’s bathroom into a “Universal Design/Aging in Place” space that included a walk-in shower with a linear drain. It also included a fold-down seat and balance bars for flexibility with use. This stunning bathroom instilled an assembly of elements that minimized hazards and requires low physical effort. While the functionality took precedence when planning this space, CairnsCraft Design & Remodel took note to blend the elements of form and function.